For this one-dimensional simulation of an AlGaN/GaN heterojunction field effect transistor (HFET) we are solving self-consistently the Schrödinger-Poisson equation taking into account strain, and piezo- and pyroelectric charge densities. At the left boundary we use a Schottky contact boundary condition with a Schottky barrier height of phiB = 1.4 eV. which fixes the conduction band edge energy Ec above the Fermi energy EF. e is the elementary charge. are described in the Schottky barrier tutorial. Our simulated structure is undoped. Note that the 2DEG is present even in the absence of doping due to piezo- and pyroelectric interface charge densities. The temperature is set to 300 K in all simulations. We only consider cation-faced structures, i.e. we have rotated the crystal so that our [000-1] direction points along the positive x direction. 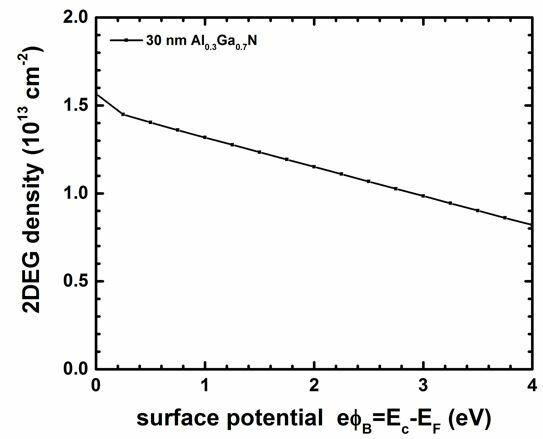 Shown are the conduction and three valence band edges together with the probability densities of the two lowest subbands of a 30 nm Al0.3Ga0.7N / 40 nm GaN heterostructure. Now we try to reproduce Fig. 2 and Fig. 3 of [Jogai2003]. mole fraction (alloy content x). 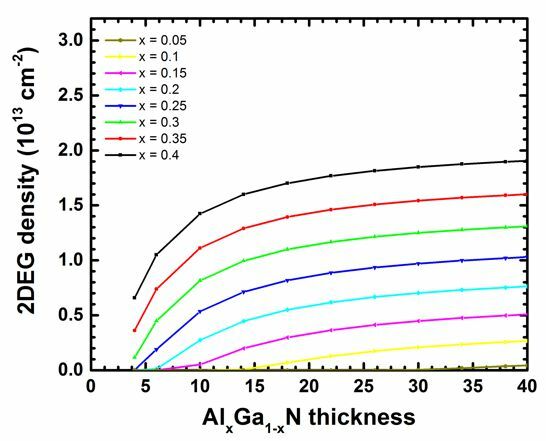 The thickness of the AlxGa1-xN barrier is defined as a variable. 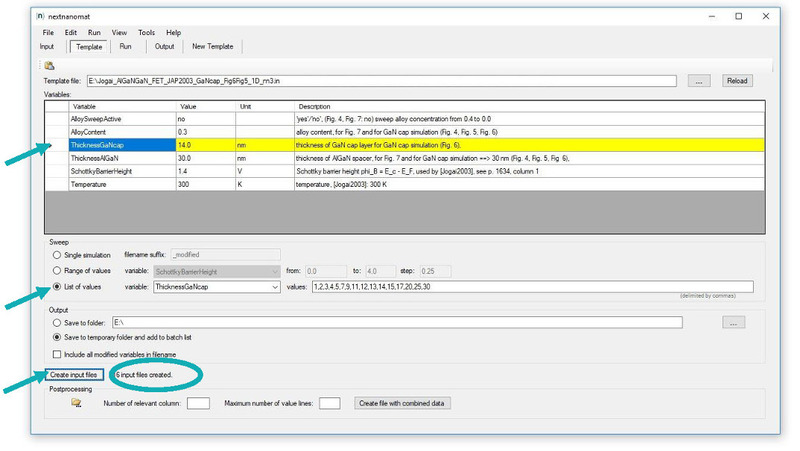 We use nextnanomat's Template feature in order to sweep over the AlxGa1-xN barrier thickness. This is shown in the following screenshot. 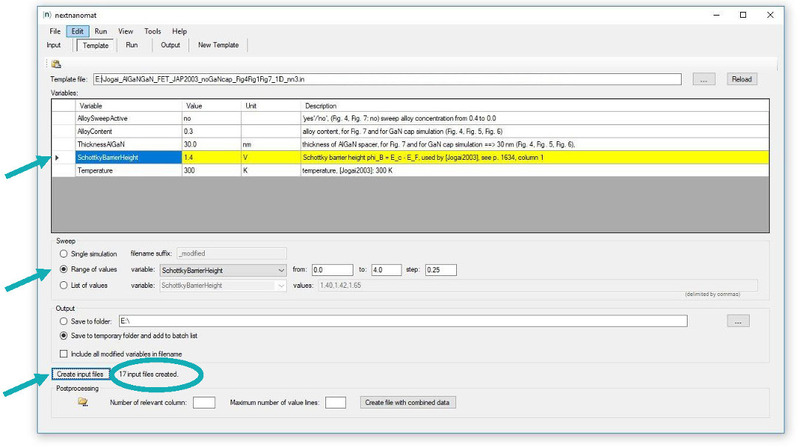 The input files are created automatically and are added to the "Run" tab. This file contains the integrated electron density for each region cluster. 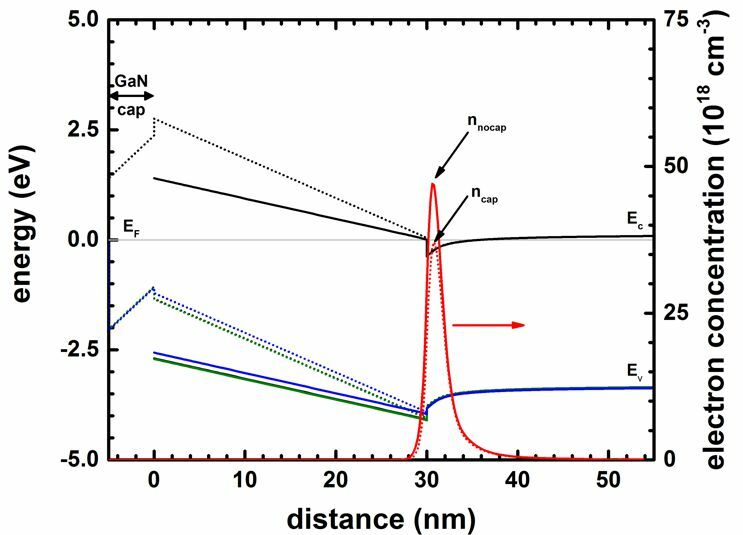 In our case, the total electron density is relevant which is the sum of cluster #3 (AlGaN barrier) and cluster #4 (GaN well) because the quantum cluster extends over these two clusters. The first column contains the sweep index which is the alloy content. The following figure shows the total integrated electron density (Total[1/cm^2]) as a function of alloy concentration for various AlGaN thicknesses. 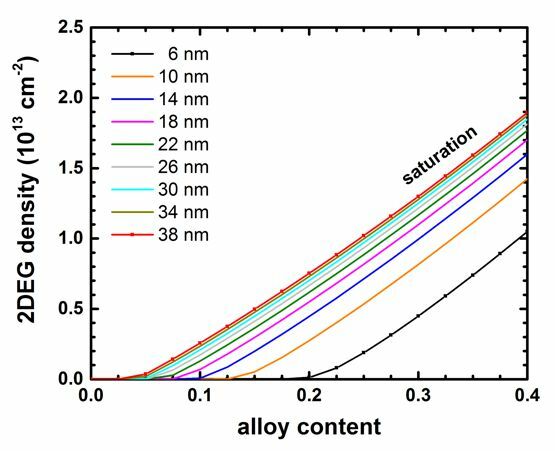 For a given barrier thickness, the 2DEG sheet carrier concentration varies almost linearly with alloy concentration x. The 2DEG density approaches saturation as the barrier thickness is increased. This fact can be better seen in the next plot where we show exactly the same data. Our results seem to be in reasonable agreement to the simulations of [Jogai2003] (Fig. 2 and Fig. 3). 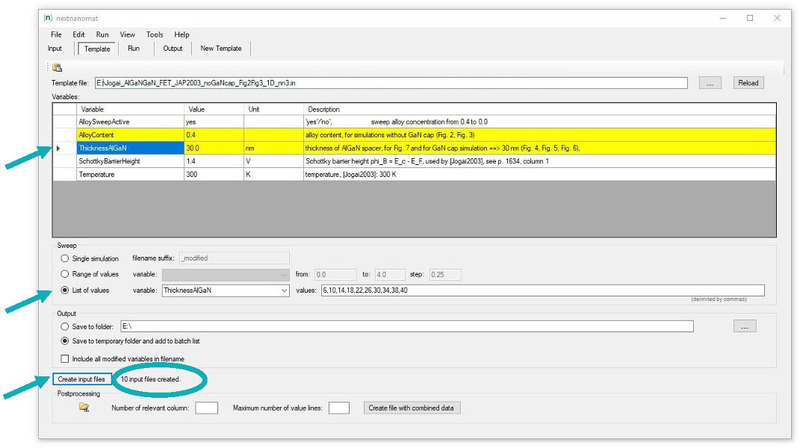 Now we vary the Schottky barrier height phiB and calculate for each value the 2DEG density. e phiB = Ec - EF. The following figure shows the calculated 2DEG density as a function of Schottky barrier height, i.e. surface potential. We used a 30 nm Al0.3Ga0.7N barrier. The results are in reasonable agreement to Fig. 7 of [Jogai2003]. Now we compare HFET structures with and without a GaN cap layer. GaN-capped HFETs have a lower 2DEG density compared to uncapped structures. When introducing a GaN cap layer, the density of the 2DEG is reduced. 5 nm cap, 30 nm Al0.3Ga0.7N barrier. The calculated 2DEG density is n = 1.03 * 1013 cm-2 (n = 1.20 * 1013 cm-2 [Jogai2003]). without cap, 30 nm Al0.3Ga0.7N barrier. The calculated 2DEG density is n = 1.25 * 1013 cm-2 (n = 1.47 * 1013 cm-2 [Jogai2003]). 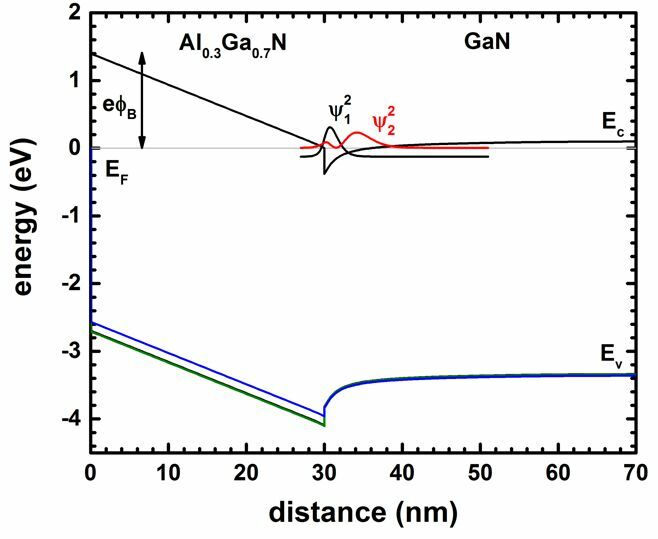 The following figure shows the conduction and valence band edges of an Al0.3Ga0.7N/GaN FET with (solid lines) and without (dotted lines) a 5 nm GaN cap layer. 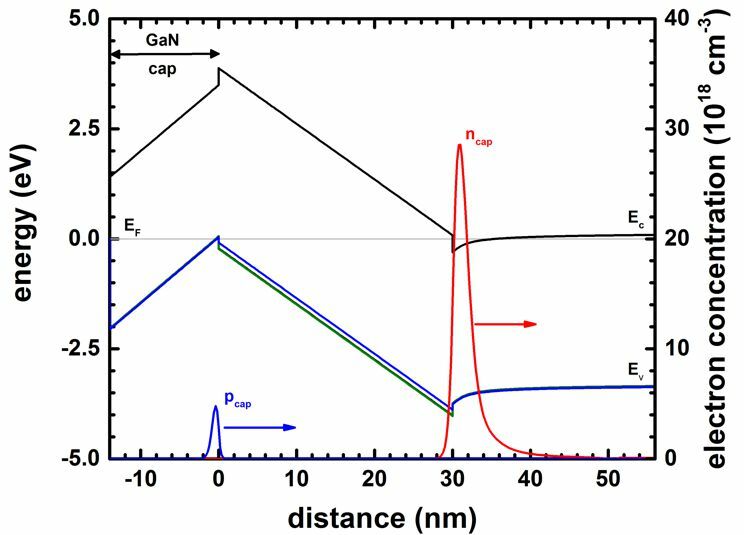 The following figure shows the band edges and the electron and hole densities for a 14 nm GaN cap layer. The Al0.3Ga0.7N barrier thickness is 30 nm. For GaN cap layers thicker than 14 nm, a 2DHG forms. The density of the 2DHG screens the surface potential so that the density of the 2DEG is maintained at a constant level even if the GaN cap layer thickness increases further. The calculated 2DHG density is p = 0.513 * 1012 cm-2 (p = 1.77 * 1012 cm-2 [Jogai2003]). The calculated 2DEG density is n = 0.839 * 1013 cm-2 (n = 1.009 * 1013 cm-2 [Jogai2003]). Now we are going to vary the GaN cap layer thickness. 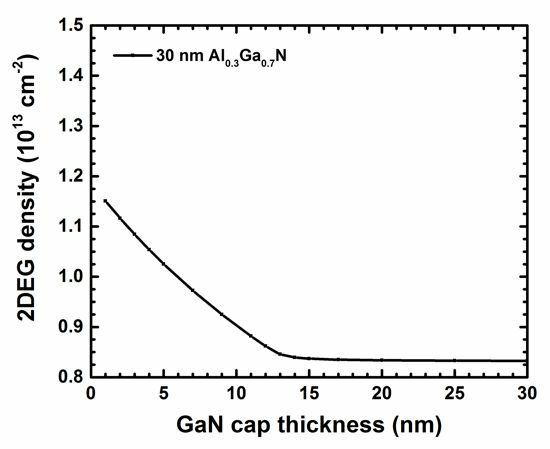 The following figure shows the 2DEG density vs. GaN cap layer thickness for a 30 nm Al0.3Ga0.7N barrier. Beyond a GaN cap layer thickness of ~13 nm (12 nm [Jogai2003]) the 2DEG density saturates.